September is National Honey Month, so as decreed by the National Honey Board. The bees creating honey may need the positive attention to shed a light on the creatures’ recent struggles. The month was first hailed by the NHB in 1989 as a way to promote the beekeeping industry, benefiting consumers and beekeepers alike. Bees have had a rough time as of late. Colony collapse disorder has been a deadly phenomenon ravaging hives. Most recently, a Zika spraying in South Carolina killed more than 3 million bees. Most recently, studies have suggested bees are dying because of pesticides called neotinoids. When bees struggle, everyone up the food chain does, too. Researchers from one study said the toxicity builds up as it moves up in the ecosystem. Scientists said some species of birds are struggling with the pesticide, too. The USDA reports North Dakota is the top honey producing state nationally. 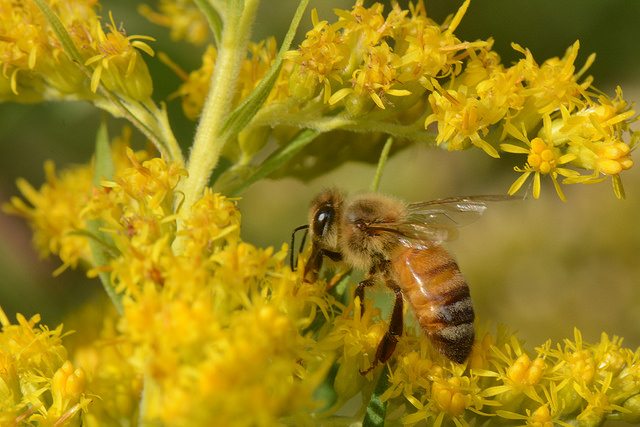 The importance of beekeeping and honey production has its cornerstone in the pollinators themselves; bees are responsible for the production of honey itself as well as the pollination of much of modern agriculture. North Dakota State has a team of scientists researching the nutrition in honeybees, as well as how temperature affects bee growth. The team utilizes gadgets such as a Micro CT machine to monitor the development of flight muscles and gut. Kendra Greenlee and Julia Bowsher were bee researchers for NDSU in 2015. The United States Department of Agriculture run NHB, with a board being appointed by the Secretary of Agriculture.